Am I the only one who thinks this clause/rule/loophole is absurd and insane? For all of you writing hate mail to me, re-read this and tell me it makes sense to YOU. "Eligibility for election or selection" does not equate to permission to actually play. Also, the mere fact that he is suspended as of now does not exclude him from being eligible for election. Selection equates to permission to actually play. Way to miss that, though. The whole All-Star voting is a joke. Guys who are out for the season are on the ballot. Guys who haven't even played yet this season are on the ballot. Guys who in the offseason openly admitted to smuggling steroids into this country for personal use over the course of three seasons are still eligible to play and can't be punished due to timing of the drug use (WTF? 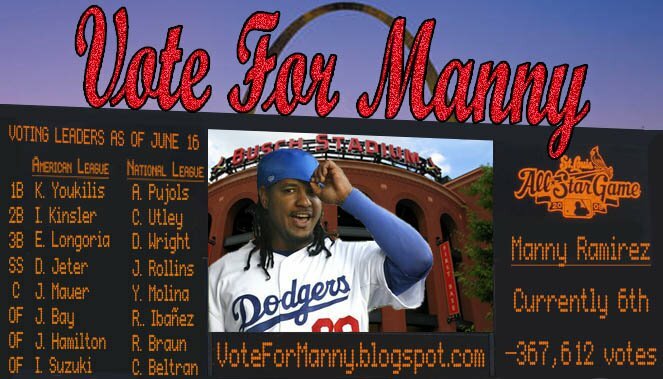 ), so why the hell shouldn't Manny be an All-Star too? If others who publicly admitted to having used steroids in the list of eligible that Manny can not? Thanks Jason for this page, all the fans of Manny and the Dominican Republic thanks to you. No one suspended for using illegal substances should be in the All-Star game. It should be only for players that don't cheat! Yeah Cheaters dont get rewards!!! BAN MANNY FOR LIFE!!!! This is to Jason Rosenberg, the creator himself. I'm a 17 year old intern at the Rivertowns Enterprise newspaper that covers Ardsley news, and I would love if I could interview you for a story I want to write about how you've started up this website. HOPE YOU ACTUALLY READ THIS and help me out. "I want to see the best players selected, not the most popular." You're absolutely right. The All star game voting process is a huge joke. Its a feeble attempt by MLB to get the fans to interact with the game. It should obviously be the best players and not the most popular.